The first round of the inaugural Super D Cup - Technical Drift Tournament kicked off at Thunderhill Raceway on March 26th, 2017. The course selected for Round One was a replica of Motorland SP in Aomori, Japan. An excited crowd of drift fans surrounded the Thunderhill Skidpad in anticipation of the intense competition they were about to witness. 30 of the West Coast's most dedicated drifters gathered to compete under an entirely new competition format. From 0930 to 1200 drivers were given an open track to show off their best drifting to the judges and fans. Judges pay close attention during this session as they select the best 16 drivers to move on to tandem competition. Key points to this track include an aggressive entry directly in front of the judges, followed by a narrow straight section that requires the proper line to maintain speed and drift. All of the drivers were pushing hard, and the improvement in the driving from the beginning to the end of the session was apparent. In Super D qualifying solo runs are not required, which means you can drive with your friends! There was plenty of action to be found during the top 16 battles. Max from GoldStar put down aggressive runs despite being in a borrowed MX-5 Miata, with Ryan just edging him out in the 20v AE86. 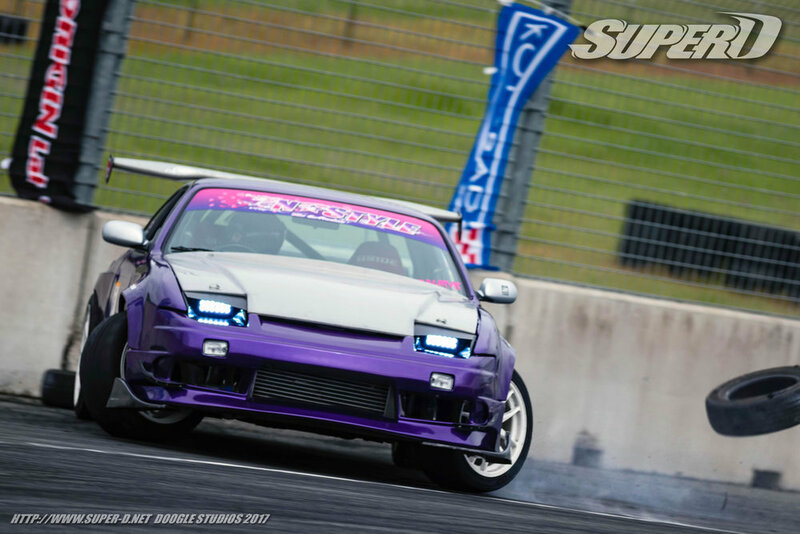 Aaron from Wolfreign was driving with confidence in his recently finished 1JZ powered S13, but a broken axle allowed Kodi from Broken Aero to advance. It was Julian vs Julian in a battle of the black and white S-chassis, with the newer S14 besting the trusty S12. Nick from GoldStar was pushing his KA S14 to its limit, but it was not enough to take out Baby Jason from Animal Style who demonstrated skillful manipulation of his high power S13. Andy from Animal Style and Lexis from RiotSquad had one of the most exciting battles of the Top 16. After a "one more time" call, Lex and his FC were able to pull away from Andy and his Beams powered AE86 - advancing him to the top 8. Roy from GoldStar was surprising everyone throughout the day with his driving, but in this battle Ryan took himself out by stalling in the chase. Julian and Luke's battle went to sudden death, but Julian proved to be an unshakeable shadow knocking out the SR20 Onevia. Baby Jason also did himself in by spinning in the last corner. You can see Kodi in his BMW-front S13 was having fun either way! 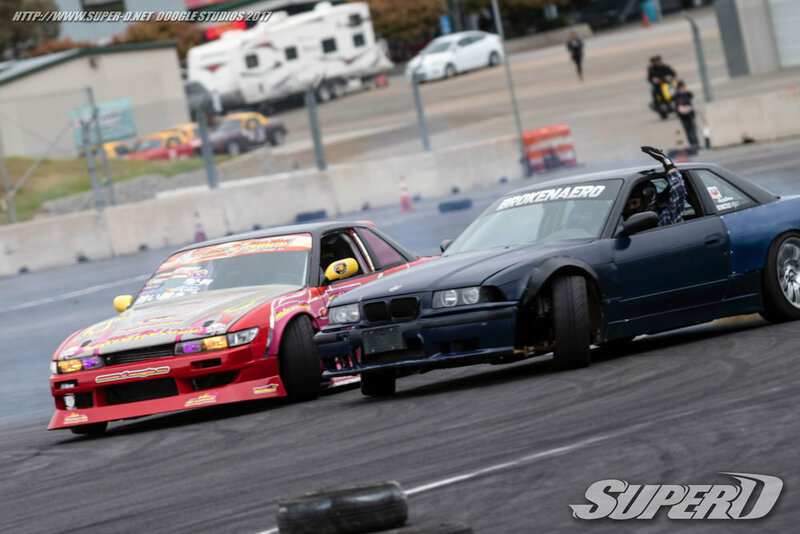 Lex's fancy footwork earned him the victory over Taichi Kasahara and his VQ35 powered RPS13. Roy and Kodi put on an exciting first battle of the top four, that led to a sudden death match. What Roy lacked in horsepower he made up in willpower by forcing his KA 240sx onto the door of Kodi's inline 6 powered S13. Julian continued to show his chasing prowess, mimicking Lex's every move and knocking out the turbo FC in yet another sudden death battle. In the battle for 3rd, Kodi gave a solid lead run with Lex right there on his door. You can see the determination in their faces. The pressure of competition is fierce, and it may have gotten to Lex on his lead run where he over rotated his entry. Thankfully the cars were safe! In the Finals we saw Julian Jacobs take on Roy Cardoso for 1st and 2nd. With both cars running a KA24DE, the battle had potential for close tandem from start to finish. Julian was knocking on Roy's door the entire run with the crowd on their feet. Roy was looking to follow suit but attacked Julian's door a bit too aggressively, resulting in a spin! And with that Super D Cup Round One is history! Thank you to everybody who came to the event, and to everybody who supports Super D! See you at Round 2!